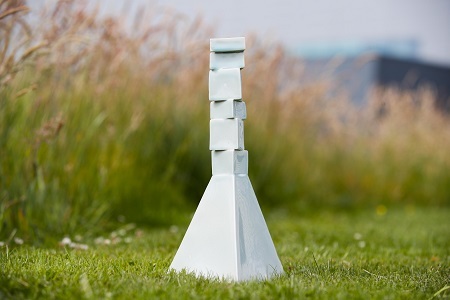 The McGarrell Reilly Group and Business to Arts are very happy to announce that artist Alva Gallagher has been commissioned to create a new piece of sculpture named ‘Rise’. The decision was made following the Open Call to Irish and international artists to submit concepts for ‘The Sharp Building Commission’. The brief to artists was to create an original and innovative sculptural installation in response to unique environment, architecture, historic and cultural references associated with the new building and its location off Hogan Place in Dublin’s core city centre. ‘Rise’ is a double-height glass sculpture that will be unveiled in early 2018. It will be visible from both the interior and exterior of The Sharp Building and will be seen by office staff, local viewers and commuters. Award- winning Irish sculptor, Alva Gallagher, is a visual artist whose work involves a continuous exploration of oceanic movements and elements. She is passionate about the sea and mirrors its ferocity and serenity through the manipulation of her chosen mediums (glass and bronze) from their molten to solid states to explore concepts of depth and rhythm. Alva has exhibited extensively. Recent highlights include the Royal Society of Marine Artists Annual Exhibition at the Mall Galleries, London; The Traver Gallery Seattle, USA; and The Saatchi Gallery, London. Her work appears in State, National and International Collections, including The OPW, The National Museum of Ireland, BMW and in the iconic ‘Gherkin’ building in London. Alva Gallagher is an established artist who has won numerous awards for her work including The Jim McNaughton/ TileStyle Bursary Award with the Beacon Medical Group at the Allianz Business to Arts Awards, and the ‘Work of Distinction’ merit award at the ‘Heal’ Exhibition in The Naughton Gallery, Belfast. She has exhibited her work extensively in Ireland and abroad. Highlights include the highly acclaimed RSMA Annual Exhibition at the Mall Galleries London, the CultureCRAFT, Derry Londonderry City of Culture Exhibition, The Traver Gallery, Seattle, USA, The Saatchi Gallery London, La Gallerie SEMA, Paris, The European Central Bank, Frankfurt, Germany, European Glass Context Biennale, Bornholm, Denmark and The London Underground with Art Below. In 2009, she was one of 16 artists selected for Pillar of Art at Hof 96 Gallery Berlin and Tokyo and the ‘Is Mise Ireland’ touring exhibition from Shanghai to the Central Academy of Fine Art in Beijing, China. She received the first Irish Partner Scholarship for Pilchuck Glass School in Seattle USA. She most recently celebrated a sell-out solo exhibition at the Gibson Hotel, Point Village Dublin, Ireland as well as unveiling a new body of sculpture in ‘Adaptations’ at Farmleigh Gallery, Dublin and will exhibit with the Catherine Hammond Gallery in 2017. McGarrell Reilly Group is a privately owned property group that has created some of the highest quality developments in Ireland, the UK and Germany. This group prides itself on the quality of their portfolio and constantly strives to add value to each of their projects. 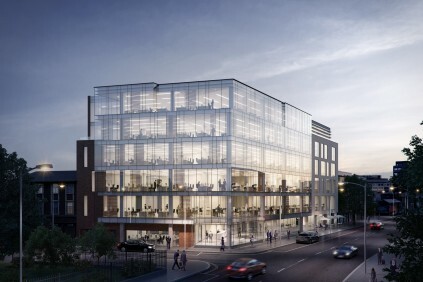 Successfully operating for over 35 years, some of McGarrell Reilly Group’s best-known developments / refurbishments / investments include: Iveagh Court Complex, Dublin 2; The Watermarque Building, Dublin 4; P6 in East Point Business Park; 25-28 Adelaide Road, Dublin 2; CityNorth Business Campus; and Spitalerhof in Hamburg. The building is named after George Sharp, RHA, an Irish portrait and figure painter who resided at Hogan Place during the early 19th Century. The surrounding area was rich in heritage and popular amongst architects, sculptors and artists including Irish sculptor John Hogan, whom the street is named after. This new 6 storey, over-basement office space, in the historic heart of Dublin 2, will transform the streetscape of Hogan Place. 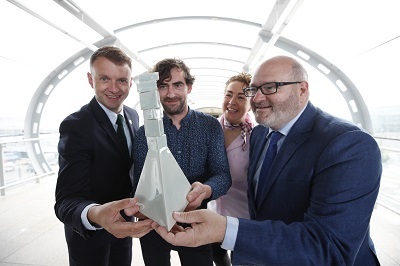 For the 26th year, the Allianz Business to Arts Awards award sculpture has been commissioned by daa. This year’s award ‘Dream Roads’ was created by Donegal artist Kevin Callaghan. Kevin Callaghan is an Irish born artist based in Cork (1982). He completed his MA at The Royal College of Art in London in 2013, in 2008 finished the ceramic skills and training course with DCCOI and a BA from the Crawford College of Art in 2010. Kevin’s artist residencies include the Experimental Sculpture Factory in Jingdezhen, China and The National Sculpture Factory in Cork. Kevin was shortlisted for the Young Masters Art Prize in 2015. He has exhibited at London Art Fair, The Saatchi Gallery, The Victoria and Albert Museum among other national and international shows. Kevin teaches workshops at the London Sculpture Workshop and acts as a visiting lecturer. To read this years shortlist click here. The winners of the 2017 Allianz Business to Arts Awards will be announced on 4 September at the Bord Gáis Energy Theatre. Please contact awards@businesstoarts.ie if wish to attend the awards ceremony. This years Allianz Business to Arts Awards saw high levels of entries, increased regional activity and long-term partnerships, that continue to evolve through diverse activation campaigns. The 2017 Allianz Business to Arts Awards will be presented on September 4th at the Bord Gáis Energy Theatre. The awards recognise businesses, artists and art organisations that develop creative partnerships, bringing art into the workplace to build relationships that benefit communities across Ireland. The collaboration between business and arts can take place through sponsorship, staff engagement, commissioning, CSR initiatives or community engagement. “We are inspired by the creativity, innovation and cost effectiveness demonstrated by the various entries this year. Ahead of Business to Arts’ 30th Anniversary in 2018, these partnerships help to drive us in our mission; to enable and support creative and business minds to collaborate and make unexpected things happen. In the 26th year of the Awards, we have received the highest number of entries to date, displaying the best examples of creative partnerships between corporates and creative communities. “We are really proud of our longstanding association with the Allianz Business to Arts Awards, which continue to showcase the best in collaboration between the Irish Artistic and Business communities. From an Allianz perspective, it is very fulfilling to be in a position to encourage and acknowledge partnerships that deliver lasting value for our artists and for business, but to also see the hugely positive impact such partnerships have on communities across the country and on our society at large”.